Caption: From left to right: Michael Huber, Max Verstappen and Klaus Winkler Possibly yesterday’s most shared picture: A Formula-1 race car in the snow. Red Bull hosted a unique Show-Run on Mount Hahnenkamm, at over 1,600 metres above sealevel. Max Verstappen, probably the youngest Formula-1 pilot of all time, raced around the Hahnenkamm in Sebastian Vettel’s World Champion Car. The Dutch racer inofficially opened the 2016 Formula-1 Racing Season in front of 3000 spectators. Needless to say, it was quite slippery on the slopes. 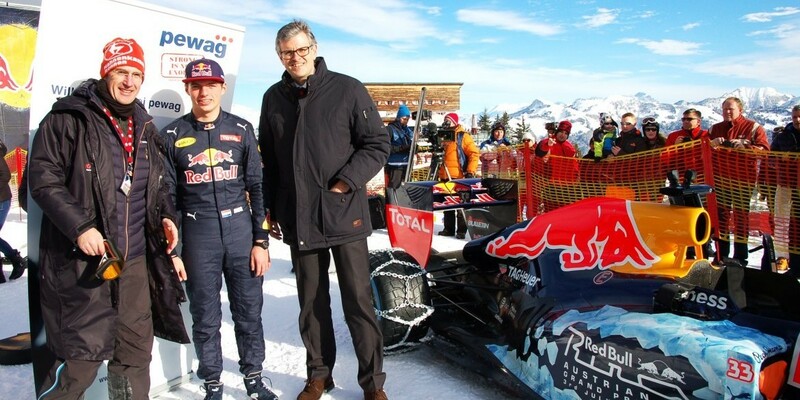 Demonstrating the RB7’s over 750 horse power on snow was a challenge for the Red Bull Youngstar! Spikes wouldn’t do, so special snowchains were manufactured for the thick Formula-1 tires. The course began right behind the starting hut, from where the ski racers will face the Streif in next weeks 76th Hahnenkamm-Races. The young Dutch Formula-1 Racer seemed relieved to be on the slope in a car rather than on skis.